The price I, and many others, pay in freedom does not deter us. I wish that my two young daughters and baby son would not have to pay this price together with me. But for my son and daughters, for their future, we must continue our struggle for freedom. In my village, Bil'in, Israeli tycoon, Lev Leviev and Africa-Israel, the corporation he controls, are implicated in illegal construction of settlements on our stolen land, as well as the lands of many other Palestinian villages and cities. 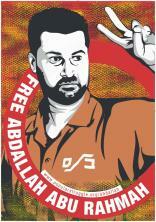 Adalah-NY is leading an international campaign to show Leviev that war crimes have their price. Bil'in has become the graveyard of Israeli real estate empires. One after another, these companies are approaching bankruptcy as the costs of building on stolen Palestinian land are driven higher than the profits. Unlike Israel, we have no nuclear weapons or army, but we do not need them. The justness of our cause earns us your support. No army, no prison, and no wall can stop us.